When did Satan fall from heaven? What was the reason? Pride was the main cause for both Satan’s (Lucifer at the time) and mankind’s fall. For that matter, pride seems to be at the center of all sin. After the fall, which we will read about in the next paragraph, Satan was probably jealous that mankind was given dominion over the earth as Genesis 1:26 says “let them have dominion over the fish of the sea and over the birds of the heavens and over the livestock and over all the earth and over every creeping thing that creeps on the earth.” Satan hatched a plan. He would deceive Eve and make her disobey God by taking to eat of the tree of the knowledge of good and evil and Adam would do the same. After this, “And the LORD God said, Behold, the man is become as one of us, to know good and evil: and now, lest he put forth his hand, and take also of the tree of life, and eat, and live forever” (Gen 3:22) and so “the LORD God banished him from the Garden of Eden to work the ground from which he had been taken” (Gen 3:23). Not only were they banished from the Garden of Eden, they would now receive their wages and that was death (Rom 6:23) and would eventually die because the soul that sins will die (Ezk 18:20). They had lost their chance at eternal life and their only hope would be that they repented but there is no evidence that they ever did. We just don’t know for sure if they ever did. Isaiah gives us a good look at the cause of Lucifer’s fall from heaven in Isaiah 14:12 “How you have fallen from heaven, O star of the morning, son of the dawn! You have been cut down to the earth, You who have weakened the nations”. The Hebrew word for “star” is “Helel” or “Hylel” and means the “shining one” so Lucifer must have been a glorious angel full of light at one time but then something drastic happened, “But you said in your heart, ‘I will ascend to heaven; I will raise my throne above the stars of God, And I will sit on the mount of assembly In the recesses of the north” (Isaiah 14:13). Here we read that Lucifer was full of himself, full of pride, and wanted to “ascend to heaven” and raise his throne about the stars (or angels) of God and wanted to “sit on the mount of assembly in the recesses of the north” meaning he wanted to sit on the throne of God but in place of God. This fall must have apparently happened shortly after the earth was created for he had to have had an earth to be cast down too. Satan wasn’t the only one to fall and there will yet be more in the future. That’s because anyone who is full of pride is at war with God (James 4:6) because “Pride brings a person low, but the lowly in spirit gain honor” (Prov 29:23) which is why James wrote “Humble yourselves before the Lord, and he will lift you up” (James 4:10). The opposite of that is true as well; if you lift yourself up, He will humble you. Either we will humble ourselves before God or He will do it for us and guess which one is more painful? This is because “God opposes the proud but shows favor to the humble” (1 Pet 5:5). For those who refuse to voluntarily humble themselves God warns “Pride goes before destruction, and a haughty spirit before a fall” (Prov 16:18). The word “haughty” means lifted up or to look down upon others from a lofty position and that position is only for God to have. To be haughty is to be full of pride and God will not tolerate such an attitude, just as He didn’t tolerate Lucifer’s pride. Ezekiel wrote about the prior state of Lucifer by writing “You had the seal of perfection, Full of wisdom and perfect in beauty” (Ezk 28:11). At one time he was “the anointed cherub who covers, and I placed you there. You were on the holy mountain of God; you walked in the midst of the stones of fire” (Ezk 28:14) and “You were blameless in your ways from the day you were created until unrighteousness was found in you” (Ezk 28:15). God describes the reason for Lucifer (or Satan’s) fall “Your heart was lifted up because of your beauty; you corrupted your wisdom by reason of your splendor. I cast you to the ground” (Ezk 28:17). He was in love…with himself and so his “heart was lifted up” because of pride due to his beauty, wisdom, and splendor. There are many in the unsaved world today just like that and their fate will be the very same fate as Satan’s spoken of in Revelation 20:10-15. Why more of us, including myself, won’t humble ourselves is a mystery to me. If we only fully understood the awesome, majestic, glory of God, we would all fall down before Him and humble ourselves. No one can truly be saved until they humble themselves before God, until they repent of their sins, meaning that they turn away from them and forsake them and then turn to their only hope of being saved and that is Jesus Christ. He will be your Lord and Savior or He will be your Judge. That decision is strictly up to you. 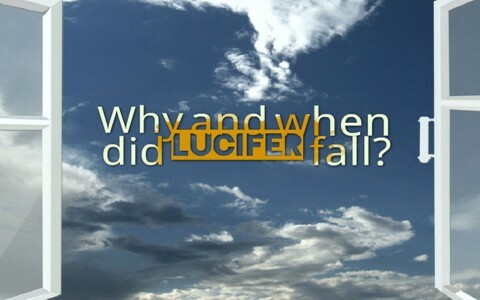 More about Lucifer (Satan) here: Is There Really a Being Called Satan? I have ofter wondered where the story about Lucifer and his angels battling against the angels that were loyal to God comes from. It seems to be a story that everyone knows, yet it does not appear in the Bible. Is it just an oral tradition, or does the story appear in full somewhere? Thank you for the Bible passages that support the narrative of the Lucifer story. I would like to know where the original narrative comes from. That should read “Dear Pastor Wellman.” Sorry for the typo. Thank you Mrs./Ms. Hagan. I would say that the original narrative is what I quoted out of Isaiah 14 and Ezekiel 14 and 18. Did you read these chapters? It is, at least to me, strongly evident the Lucifer’s pride caused his fall as pride always results in a fall. I don’t know what you mean by the original narrative? I only use the Bible as my source and that is as original as it gets since it is “God-breathed.” This might give you more on the reason that Lucifer (Satan) fell at this link: http://www.patheos.com/blogs/christiancrier/2015/07/22/was-lucifer-a-fallen-angel-a-bible-study/ Do you not believe that he fell? Thank you for your comment and question. Thank you for responding. Yes, I do believe he fell. The narrative I am referring to is the one about God creating the Angels Michael, Gabriel and Lucifer. When God creates man and tells the Angels to bow down to him, Lucifer rebels and there’s a war between Lucifer and the Angels who support him and Micheal and the Angels loyal to God. Then Lucifer is cast down and forever tries to steal souls away from God. This is a terrible paraphrase of the story, mainly for brevity. Everyone seems to know this story but no one seems to know its source, as it is not in the Bible. Is it just folklore that fills in the details of the Scripture passages you quoted? Just wondering. I see what you mean now. Thank you. There is just so much we don’t know. Thank you for your patience with me. I agree. Much mystery abounds…someday we shall know in full. Actually, I thank YOU for your patience with me. God bless you, Pastor Wellman. The fact that this narrative is nowhere in Genesis supports the evidence that Moses had been Godly inspired to write the Pentateuch. If not Godly inspired, Moses, a man, would have conveniently written a more detailed drama of the angelic rebellion. Thus, we have to wait years later to read any details of the evil ones’ fall. Hello Mr. Biggs. The New Testament states that “all Scriputre is inspired by God” and Jesus spoke of Moses with respect, but the Book of Genesis is not where Lucifer or Satan’s fall occured. The Scriptures have been mentioned, so why don’t you believe the Word? You are welcome, although I was not much help. May God richly bless you Mrs./Ms. Hagan as I perceive you have a hunger for the Word. Next post: What Did Shaking The Dust Off Your Feet Mean In The Bible?